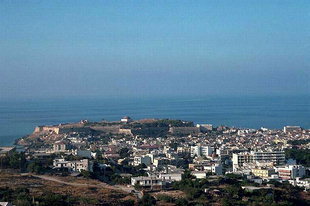 Rethymnon is the third largest city of Crete. It is the capital of the Prefecture of Rethymnon with a population of around 30,000 people. It is reached from Chania by the National Road in about an hour and from Iraklion in about 60 minutes as well. The city does not have an airport but Olympic airlines buses travel to and from Chania to connect with their flights. Taxis will also accommodate you for a reasonable price. There is a regular bus service (KTEL) to Chania and to Iraklion. These long distance buses are comfortable, dependable, and travel through pleasant scenery along the coastal road. The new bus service (KTEL) terminal in Rethymnon is on the coast in Vardinoyannidon street. The Tourist Information Office is on Eleftheriou Venizelou street on the city beach for details. There used to be a ferry boat from Rethymnon to Piraeus (Athens) but the service has stopped. Arrivals and departures are commenced via Souda in Chania (40 minutes) or Iraklion (1hr). Rethymnon has retained more evidence of the Venetian and Turkish eras than the other cities of Crete. This is partly because it was not bombed as heavily during World War II as was Chania and Iraklion . The buildings that remain are not as important as the Loggia of Iraklion or the church of San Francesco in Chania, but the past reveals itself in the streets of the Old Town, with their decorative doorways and ornate fountains. 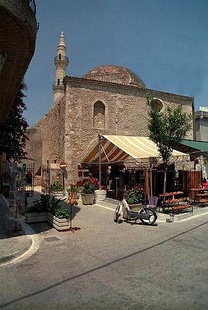 Rethymnon has also preserved its Turkish mosques: five out of the original eight remain and an effort is being made to restore them for various uses. Rethymnon has taken advantage of its charming setting and the Venetian harbour in the Old Town and the area beneath the walls of the Fortezza are filled with tavernas and small hotels. Because Rethymnon is at the halfway point along the north coast of the island, the Venetians utilized its strategic location as a way station and refuge during times of trouble. Rethymnon reached the height of its power and wealth during the period of Venetian occupation; indications of this are visible among the remaining buildings dating from that time. 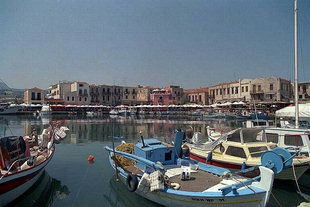 Among the cities of Crete, Rethymnon has been characterized as the city of culture and literature. It is famous for the Carnival that is organised every spring before the Easter Lent with a great masker parade. The city then attracts people from all over Crete and Greece and has a very lively atmosphere.